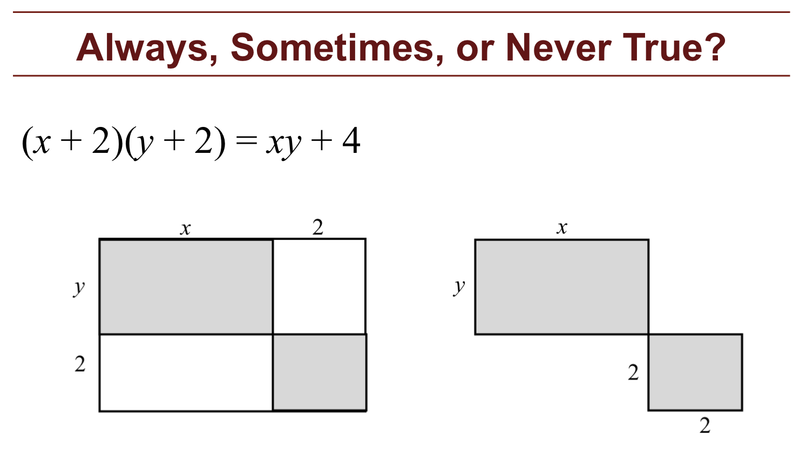 Resist common errors when manipulating expressions such as 2(x – 3) = 2x – 3; (x + 3)² = x² + 3². Carry out correct algebraic manipulations. After a whole-class introduction, students work in small groups on a collaborative discussion task. Students return to their original task and try to improve their own responses. Each student will need two copies of the assessment task Equations and Identities, a mini-whiteboard, a pen, and an eraser. Each small group of students will need Card Set: Always, Sometimes, or Never True? (cut into cards before the lesson), a marker pen, a glue stick, and a large sheet of paper for making a poster. 15 minutes before the lesson, a 1-hour lesson, and 15 minutes in a follow-up lesson. Timings given are approximate and will depend on the needs of the class.